The gentle process of lining my fair isle dress. Hugo's just mysteriously sped off in the car, I wonder if it's a Lifeboat call......................... if it is a 'shout', (as they refer to a call-out), I hope it's not like the twelve hour stint he did last time (explanation in this post). Well, hello! Are your nights suddenly getting longer? I noticed last Wednesday that it was getting dark earlier than usual, as I made my way home from my knitting group meeting. Fliss writes about the thought of shorter days here, in her blog Joshy and Belle. That blog post makes me feel warm, cosy and contented every time I read it. So shall we talk about the lining of my fair isle dress? The last time I did any cutting out of fabric from a pattern, was at school a good twenty years ago, in my sewing class. What I learnt seems to have stuck a little, and I must have absorbed something from my Mum, who is superb at making curtains and clothes. I've not made my own pattern before, so I blocked out of my mind any thoughts that I didn't have a clue what I was doing. My friend Bob was going to help me do the lining for my dress, but she couldn't make it after all. So I thought I'd go ahead and try my hand at it all by myself. I traced round the outline of my dress, and sort of muddled through, eventually producing something that passed as a pattern for the lining. (Hugo's just returned! It was a lifeboat shout, (swimmers in difficulty at Holy Island), but he didn't get on the boat, they already had enough people by the time he arrived, and he's quite relieved apparently, as he needs the loo, I'm sure he'll be thrilled I told you that nugget of information. There's no toilet on the lifeboat, that immediately rules me out as a volunteer, I need toilet facilities available at all times, within reason). Anyway, back to the lining. I was going to use the fabric in the above photo, which I love, it's an old curtain from a charity shop, but there wasn't enough fabric unfortunately, so I returned to my fabric stash. I found two single bedsheets, also found in a charity shop, and thought they would do the job. As it turned out I only used one sheet. How timely that I had some bedsheets in my fabric stash. All buying of old bedsheets in the future, will from now on be perfectly justifiable. As opposed to in the past, when it was maybe a little strange, as I hadn't a clue what I was going to use them for. Same goes for the old curtains. But maybe that's the whole point of a stash, it's irrational existence is a big mystery until it becomes indispensible and very useful. Things seem to be going quite well with the lining, which is slightly worrying as these things are never easy in my experience. I'm really hoping I haven't missed some glaring mistake. I'm trying to be meticulous. I've tacked the lining together, and have also tacked it into the dress, to see how it fits. I've surprised myself by enjoying the whole dress-making process. The cutting of the fabric, the gentleness of it all. And it's a lot quicker than knitting. I started my lining last night, and I'm almost ready to sew it together on the machine and pop it into place. It's given me a bit of a taste for dress making, and I think I like, especially if it was to be from a pattern already cut and measurements sorted. I can't get over how FAST it is! Bob should be at my knitting group meeting tonight, so I'm going to take the dress and lining along for her approval. The others in the group might have some tips too. Just before I head off to my Wednesday night knitting meeting, some of you asked what the pattern is for the cardigan I knitted above, shown a few posts back. I've had a rummage, and found the pattern. It's fom the Rowan Magazine, number 39 (Spring/Summer 2006). The pattern is called 'Crinkle', by Martin Storey, and it's knitted in Rowan Cotton Glace. The main body of my cardigan is knitted in green, the trim is lilac, I don't have the ball bands anymore, so I can't give you the numbers of the colours I'm afraid, sorry about that. Pattern for a knitted rosette. Hello, in this pattern, I am going to show you how to knit the ruffle and the ribbons for this rosette, the instruction to make the central round section (covered in fabric above) of your rosette comes at the end. When laid out on a flat surface, your knitting should look as above, you should have created a circle. 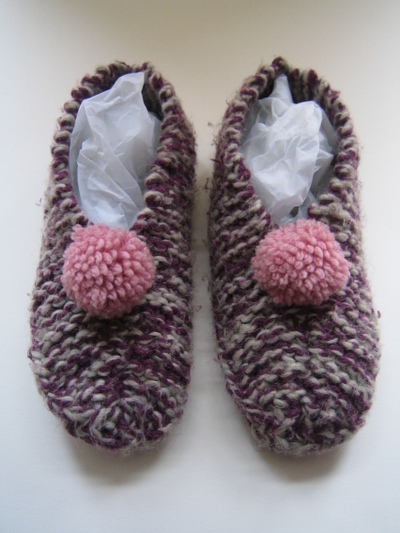 The ribbons are knitted using garter stitch (every row knit), which is different to the stitch you used for the ruffle. Using garter stitch ensures the ribbons lie flat. Now knit a second ribbon, because you'll need two of them. Well done! And now you're ready to create the central section for your rosette, so go to my post on assembling your rosette, found by clicking here. Now you've knitted, or crocheted, the ruffle and ribbons from the pattern given, I'm now going to show you how to create the central round section of your rosette, and how to put your rosette together, so that you end up with a rosette like the one in the picture above. I'm using my knitted rosette in this tutorial. This tutorial is also to be used for your making the middle part, and assembling your crocheted rosette. That's it! Now you can go straight on to assembling your rosette! Have fun! Taking the ruffle part of the rosette you already made, start to sew up the ruffle like this: First, sew the end rows together, to complete your circle. Using the same yarn you knit or crocheted with, fold each ridge back, to half way across the section you are folding thr ridge on to, and sew down, creating a fold. (I've used different coloured yarn, just so you can see what I'm doing). Once sewn up, the ruffle should look like above. (This is actually the back view above, turn it over, and have the other side as the front, I think it looks more like a proper ruffle). Here you go, the front of the ruffle, above. Now measure the diameter of the empty space, in the middle of your ruffle circle. You are doing this because I would like you to cut two little circles of cardboard, from your cardboard box. (The middle of my circle measures 5 cm, as you can see above). I used a compass to draw the circles, made life so much easier when it came to cutting the circles. I made two circles of card, purely to get a decent thickness, so that they lie level with the ruffle, creating a reasonably flat surface to attach the circles you'll make in a minute, that will sit on top of your ruffle circles. You see what I mean above? Your two card circles, should be a similar thickness to the ruffle, because you will be sticking bigger circles to the front and back of these. Now you're going to make the bigger circle for the front of your rosette. Make the diameter of your circle 1.5 cm bigger than the circle sitting in the middle of your rosette, (the circles you just made). You should now have two little circles, and one big circle. Now glue your two smaller circles together, and then glue those onto the middle of the larger circle, as above. Here's the side view of your three circles stuck together, above. Now you're going to measure for the fabric that is going to cover the larger circle of card. Make sure the diameter of the circle of fabric is 1.5 cm bigger than the larger circle of card, because you want to be able to fold the fabric round the sides and to the underside of the card circle. My circle of fabric, above, turned out a bit wobbly, but that's not a problem, it just needs to be able to wrap around the card circle, and be able to be sewn at the back. (At this point, if you want to embroider a design, or letters, or whatever, onto this centre section of your rosette, now is the time to do it, before you stick your fabric onto your card circle). Now glue your circle of fabric to the larger circle. Thread your needle, and have the thread double, for strength. Now start sewing by gathering up the fabric as you go round, as I have above. Once you've sewn all the way round, and pulled your thread firmly, it should look like above. Turn the circle over, and you will see you have the front of the central section of your rosette finished. Before you do the back section of your rosette, you need to sew on your ribbons. Like above. Careful how you place your ribbons, they don't sit directly ontop of each other, they are staggered, so that both ribbons can be seen nicely. Now you're ready to finish off your rosette. With the central section you have made, in place, turn the whole rosette over, so the back is facing you. Now measure a for a circle to cover the back of your rosette. It needs to be bigger than the larger front circle. I measured mine to be 2.5 cm bigger than the small central circle. The card I used for this back circle is different to the card I used for the other circles, it's thinner. You could use the card from a cereal box, or for something a little smarter, you could buy some nice white card, or any other colour of course. You also need to create an attachment for your safety pin. Using a hole puncher, I punched two holes into the same card I used for the circle to go on the back of the rosette. I punched the holes a small distance apart, then cut an oval shape round them, as above. I then placed the back of the safety pin through the two holes, as above. Now glue the circle of card just cut, with a generous great big blob of glue, to the small circle in the centre of the rosette. Position your safety pin, and glue that in place. You'll need a chunky wool, (I used Sirdar 'Click-chunky with wool'). 2 x 50g balls. 5.5mm,(no.5), needles. Abbreviations: K=knit, p=purl, st.(s)=stitches(es), sl.-slip, tog=together, t.b.l=through back of loop. 1st row: sl.1, k10, p1, k10, p1, k11. 2nd row: sl.1, k33. Repeat row 1 & 2, 23 more times. (Mark the beginning of of the last row with a stitch marker). 49th row: sl.1, k2 tog., knit to last 3 sts., k2 tog. t.b.l., k1. Repeat last 6 rows once more. 61st row: same as 49th row. Next row: sl.1, (k2 tog.) to last st., k1. Next row: sl.1, (k2 tog.) to end. Next row: (k2 tog.) to end. Break off yarn, thread through remaining stitches and fasten off. Join the seam from this end up to marker. Join back seam. Make the second slipper the same. These slippers are for an adult foot, and they are stretchy, so aren't a determined size, though they fit me well and I'm a size 5/38 shoe. Just add a few more rows in to make them bigger, or take out rows to make them a little smaller.